Business correspondence, arranged chronologically, of George W. Scott, one of the first residents of Edgerton, Kansas. A large portion of the collection is correspondence between Scott and Frank S. Hammond, Scott's partner in a 20,000 acre ranch in the Texas panhandle. Much of the correspondence deals with their attempts to raise cattle, lease the land, and sell or trade the property. Hammond worked as a general manager for several railroads (Kansas City, Fort Scott, and Memphis Railroad Company; Kansas City, Shreveport, and Gulf Railway Company; and the Kansas City, Watkins, and Gulf Railway Company) that were in the process of expanding their lines, and mentioned these activities in his letters. Due to their real estate investments in Texas, many letters come from banks, insurance agents, and land surveyors in the panhandle. Scott also served as secretary for the Johnson County Fair Association and owned the Gardner Lumber Company. Scott frequently corresponded with creameries, dairy farmers, wholesale dry goods retailers and seed merchants, including the Kansas Seed House owned by Frederick W. Barteldes in Lawrence. Also included are invoices, checks, contracts, and inventory lists from various businesses. 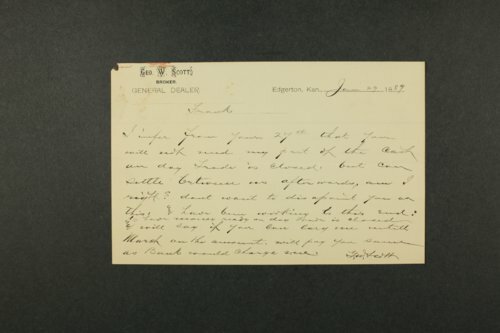 Collections - Manuscript - Scott, George W.